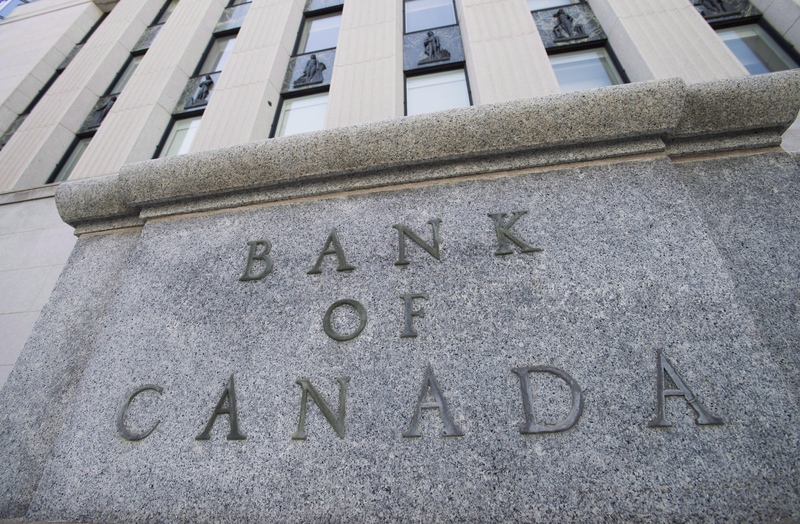 Money-market traders, already having written off a hike at Wednesday’s Bank of Canada meeting, are beginning to doubt that policy makers will pull the trigger next month either. While the Federal Reserve is widely expected to proceed with another quarter-point interest-rate increase in two weeks, overnight index swaps are pricing in just 16 basis points of tightening by the BOC’s Jan. 9 meeting, down from 27 basis points less than a month ago. Investors around the world are paring back expectations for policy tightening in the new year amid signs global growth is flagging. 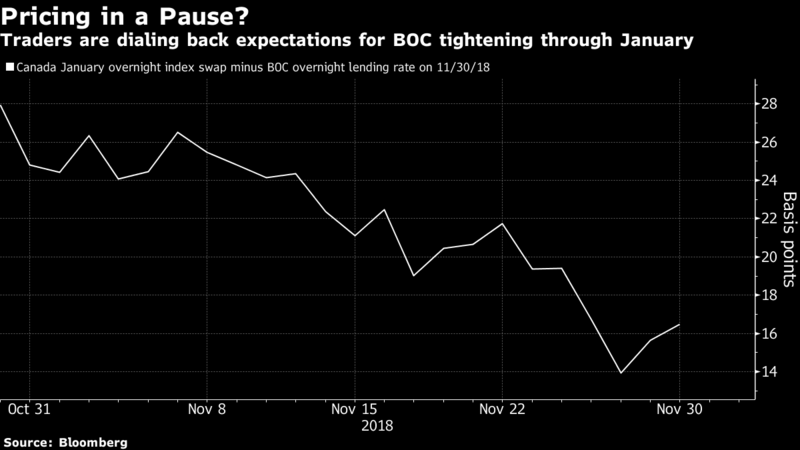 In Canada, tepid third-quarter GDP figures along with subdued oil prices are giving market participants reason to wager on a potential BOC pause. Signs of easing global trade tensions and a rebound in Canadian crude did little to sway traders Monday. The odds of a hike by January hovered around 60 per cent, based on OIS prices, down from more than 85 per cent last month. Expectations have also swung as forward-looking indicators show the country’s economic expansion losing momentum, McCormick said. While third-quarter headline growth of 2 per cent met forecasts last week, household consumption grew at the slowest pace in more than two years, while businesses trimmed investment and inventories, according to figures from Statistics Canada. Oil’s plunge has also weighed on money managers’ minds as falling prices and output signal yet another risk to Canadian growth next year. Western Canada Select crude -- the main blend sold by the nation’s oil sands -- closed at US$13.46 a barrel on Nov. 15, the lowest in Bloomberg data stretching back to 2008. A record discount to U.S. benchmark West Texas Intermediate oil forced the Alberta government Monday to announce unprecedented production cuts beginning in January. They’re expected to further dent the nation’s economy in the first half of next year, though should ease some of the concerns around pricing that were threatening the industry’s longer-term prospects. Canadian government bonds rallied on Monday, helped by large block trades in 10-year futures which all appeared consistent with buyers. A total of 7,100 futures were blocked over three trades, helping push Canada 10-year yields to the lowest since September as the securities outperformed similar-maturity U.S. Treasuries. Still, not everyone is convinced the BOC will tap the breaks on policy-tightening come January. Shaun Osborne, Scotiabank’s chief FX strategist, said the drop in expectations in November isn’t enough to erase chances of a hike next month. Which of these should matter most to the Bank of Canada right now?